Have you seen the newly renovated Lemonia's square? A place which had been left undeveloped for several years has been finaly given a facelift in order to become more attractive and welcoming to residents and visitors alike. BUT! Shortly after the renovation, the locals cutted the picturesque lemon trees from which the square had given its name. 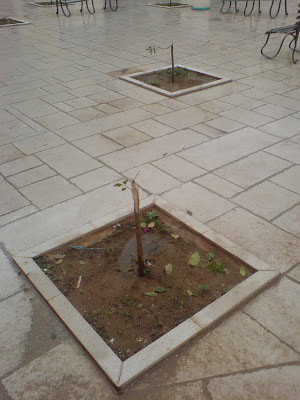 The "reason" for doing so, was that the municipality prohibited parking in the square, so the residents in order to show their anger, cutted down those beautiful trees! What a shame...! Live your myth in ...Corfu dear future visitors of this damned place! Also, what will happen to that row of ruined old buildings? They look like that since I remember myself! auti i mikri plateia exei parei ta pano tis teleutaia! Ntropi stous Kerkyraious. Aisxos! Oi katoikoi kseroun oti oi politikoi tou topou den tha stamatisoun pote na gleifoun tous katoikous gia tis psifous. Kai einai sigouroi oti den tha yparksei kamia synepeia gia aftin tin pragmatiki ierosylia! Kai dystyxws afto isxyei 100%. Oi kerkyraioi politikoi den exoun arxidia! Ntrepomai pou eimai kerkyraios, ntrepomai gia tous syntopites mou, ntrepomai gia tous politikous mas! Prepei na apagareftoun OLA ta oximata apo tin palia poli ektos apo afta twn atomwn me eidikes anages kai twn poly ilikiwmenwn. Na paroun oi koimismenoi katoikoi ta podarakia tous kai na perpatane ligo. Alla oi politikoi mas einai axristoi kai den prokeitai na ginei tipota!!!!! !